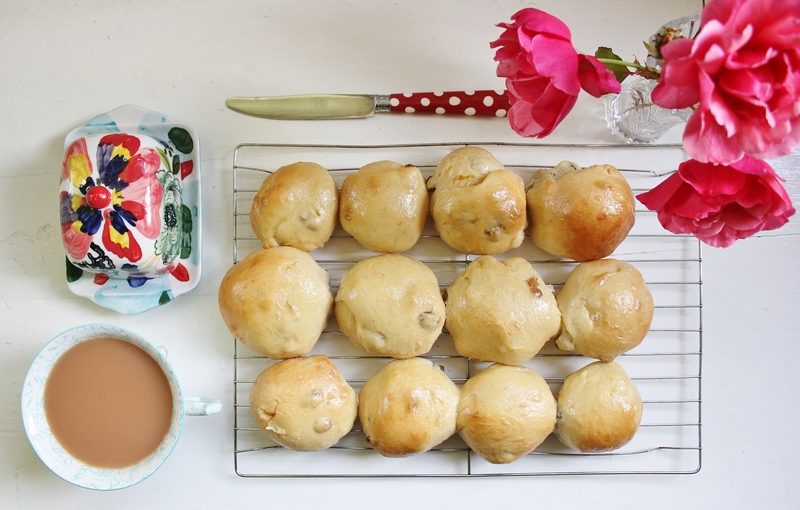 These hot cross buns fall happily in the middle of seasons as well – they sing Summer ditties because of the orange and cream cheese, but they also settle warmly into your belly and satisfy those Winter cravings. 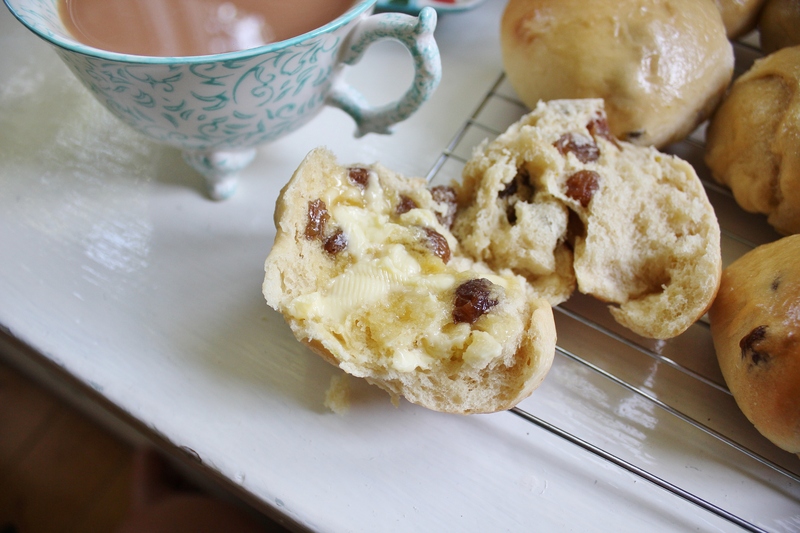 These are not your traditional hot cross bun – they don’t have the spices which usually put hot cross buns firmly in the “cold weather food” category” – they’re a little too zesty to be a normal hot cross bun. Luckily, like any good hot cross bun should be, however, they’re beautifully fluffy and absolutely must be eaten warm, slathered in butter. Warm your milk in a microwave and stir in the yeast. Set this mixture aside for five minutes to allow it to get frothy. Using the bread hook attachment of your mixer, combine the yeast and milk with brown sugar and salt. Add in the zest of your orange, followed by the sultanas. Add your flour in one cup at a time, mixing after each addition. When the flour is completely mixed in, set your mixer to a medium speed and let it knead the dough for 5 minutes. After kneading, cover your bowl with a tea towel and set it in a warm place to let the dough rise for one hour. 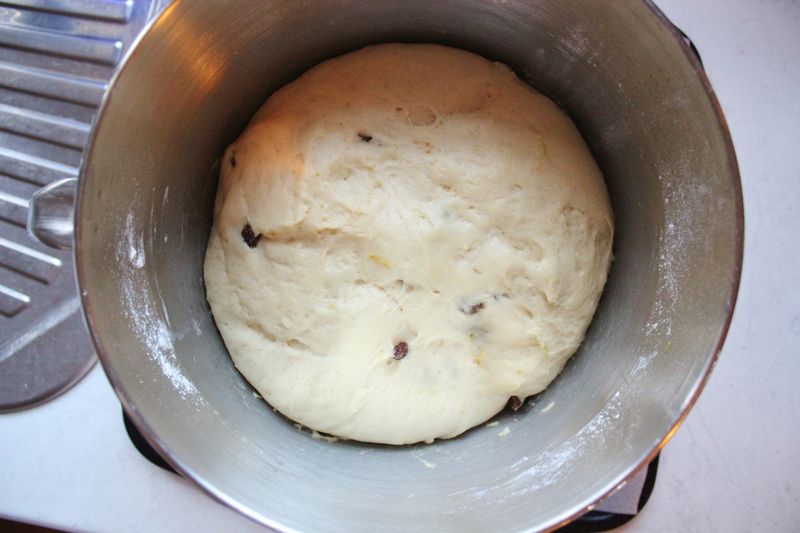 When the dough is risen, turn it out onto a baking tray covered with a sheet of baking paper. Instead of flouring a surface, simply pour a small amount of oil (I used olive oil) onto your hands and rub the dough with the oil, this will stop it sticking to you or any surface. Dan Lepard taught me this trick when I saw him recently at the Cake Bake and Sweets Show! 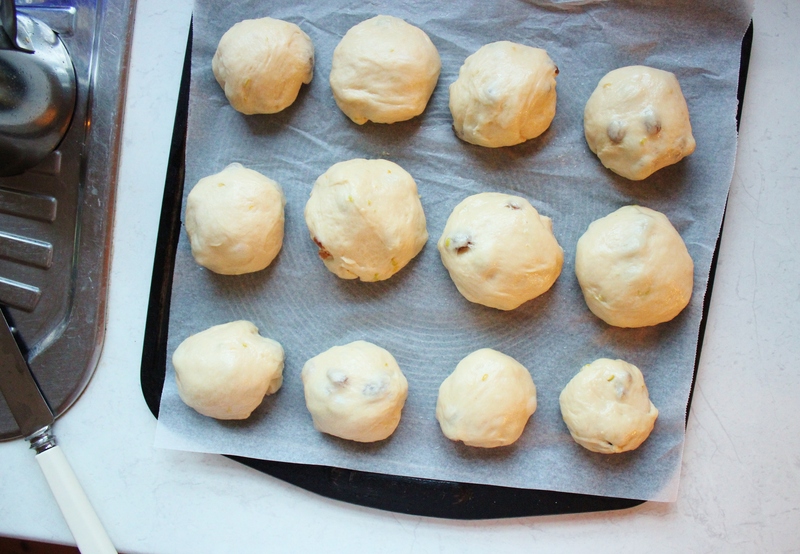 Using a sharp knife, divide the dough into 12 pieces, shape them into balls and place them on the baking tray, about 1cm apart. Set them aside for a further 20 minutes to allow them to rise again. While they rise for the second time, whisk together the icing. Make sure you whisk it thoroughly, you don’t want any lumps in the mixture. Pop the icing mixture into the fridge. Preheat your oven to 200°C and whisk up the egg to create an egg wash. When the buns have risen and started to nestle up against one another, brush them generously with egg wash and pop them in oven for 15-20 minutes, until they’re beautiful and brown on top. If they’re not browning nicely, turn the fan on in the last five minutes of baking. Remove from the oven and allow to cool briefly. 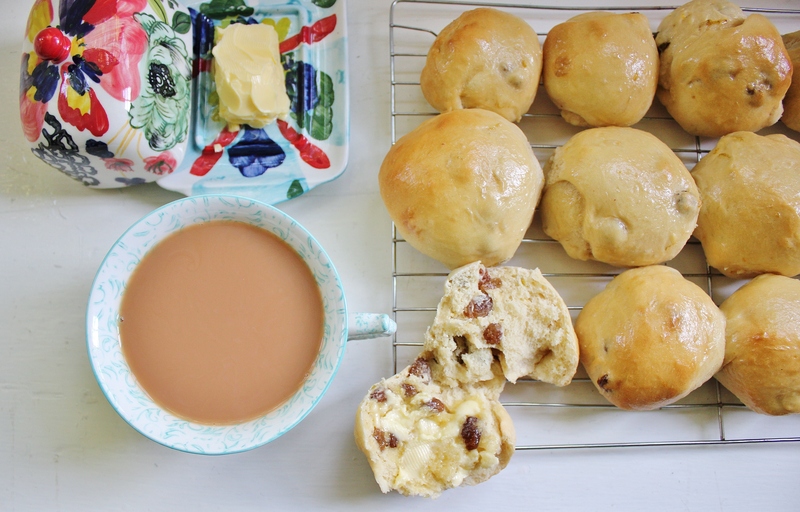 Pipe the cold icing straight onto the still-warm buns and serve with plenty of butter and milky tea. Side note: don’t do as I did and get over-excited about the prospect of warm hot cross buns and then forget to pipe on the crosses. 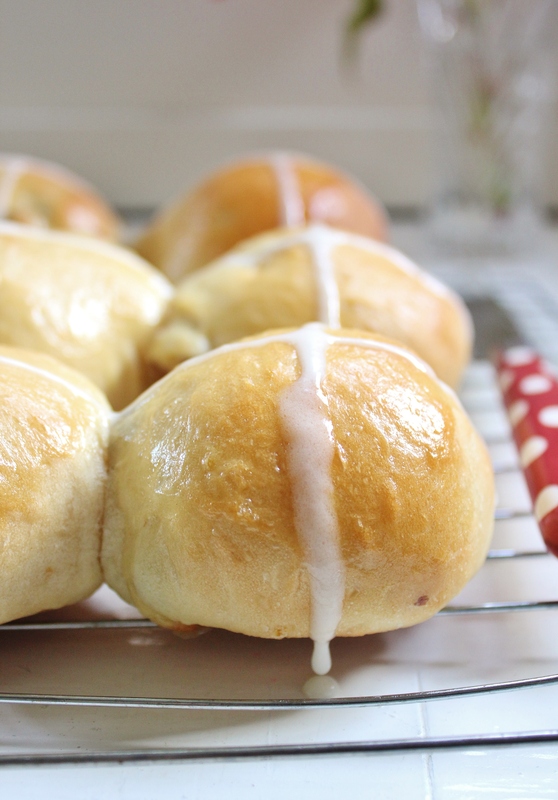 Without crosses, these babies are just hot buns! Thank you 🙂 Yes, it was such a good day for hot cross bun baking!! Your buns are beautiful, wow!! The recipe sounds simple to make too! A big plus. 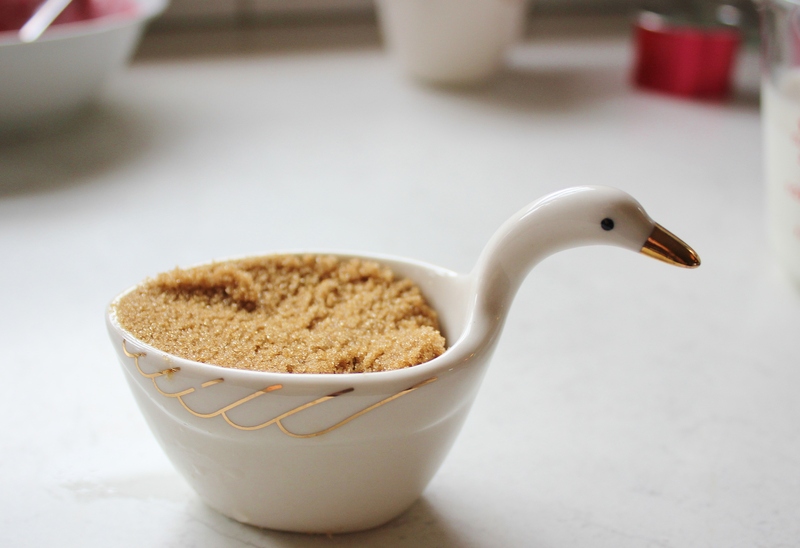 I LOVE that goose cup, is that what it is a goose? It’s fantastic. I collect ceramic and glass and have to find one. Gab I saw your buns yesterday on Fb, but I couldn’t have time to leave a comment! now I’m here to express all my admiration for those small and super cute buns… I wish I could have at least one for my breakfast! Now that I know about them, I could never get tired to eat them anytime! Thank you 🙂 Hot cross buns are a great addition to your baking repertoire!! And they’re always a winner, no matter who your guests are! These look so delicious Gab! Your photos are so perfect. Honestly. Oh that’s such a shame! I’ll be putting up a recipe for “normal” hot cross buns on Sunday – keep an eye out 🙂 Otherwise, just mix up a runny icing mixture (icing sugar, a dash of lemon juice and a small amount of water) and pipe that over instead.